On the scale of risky things to do with your pinball machines, few things rank higher than dumping them off at the house of a complete stranger who’s planning a wild party with strange and crazy people. You’d either have to be mad to do that, or else a wide-eyed optimist with an enthusiasm for pinball of epic proportions. Fortunately for all concerned, Gerard van de Sanden is the latter. 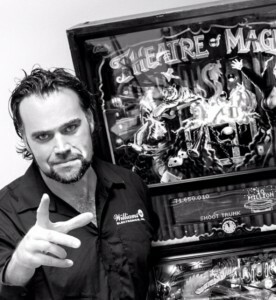 If his name rings a bell, it’s because he’s one of the Dutch geezers who was responsible for producing the Matrix pinball machine. 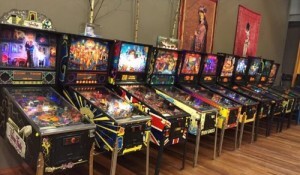 And as well as running a painting company, he also has a part-time business in the Netherlands called Flipperkast-Huren.nl hiring out pinball machines for weddings, corporate events, and of course those wild and crazy Dutch parties. “It’s just a hobby really,” says van de Sanden, “but it’s completely out of hand. My passion for pinball is so deep that I really enjoy it when other people have fun playing pinball.” And that explains why you’ll often find him at the weekends driving pinball machines around and getting them into the hands of as many people as possible. 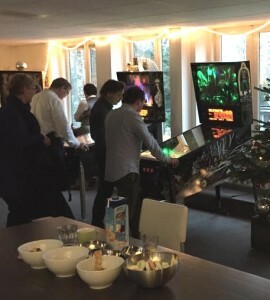 So what’s it like handing over a pinball machine for day, or even longer, to civilians – the sort of people (bless ’em!) that look mildly surprised if you mention rules and say “Oh they have rules? I though the idea was just to hit the ball about for as long as possible.” Normal people, in other words. What do you say them? And that’s it? “Well if there’s going to be a big party I tell the guy “Treat the machine like your wife. And you don’t treat your wife well then maybe we shouldn’t be doing business.” And in the six or so years that he’s been renting out machines he’s never had a problem. Well that’s not quite true. One time he rented out a Fish Tales and Roadshow to a two hundred strong all-woman party, and when he picked them up the machines were “full of beer” – although they were OK after a lot of cleaning up work. But apart from that there’s been nothing in the way of returning the next day to find the burned-out, charred remains of a machine with wild, drunken naked people dancing around the smouldering carcass or anything like that. Civilians, it seems, can be trusted with pinball machines. The good news is that the machines do get played and enjoyed. 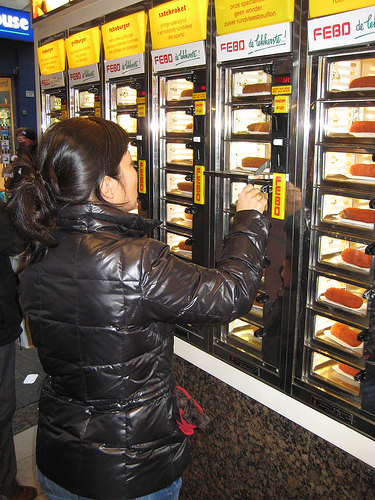 A typical machine will have had up to two hundred games on them after a good party. Given that renting a machine costs from about 130 Euros (about £100, $150) plus tax and transport, that works out at about 50p or under a dollar a game. Rental isn’t always such good value for the renters, however. Van de Sanden once rented a WHO Dunnit? to a company for three months for 1000 Euros, and when he collected it it had had only nineteen plays on it (and those were probably put on by the night security guard.) That’s over thirty nine quid or sixty bucks per game, which surely has to be some sort of record. But that’s not the norm. More often when he comes to collect the machines, the host is well on the way to becoming a pinhead. “Always I get asked ‘Where can I buy one from? Can I but this one?’ And also ‘Is it difficult to maintain? '” says van de Sanden. “When I lift the playfield to show them how it works, most of the guys are amazed and really love it,” he adds. 130 Euros may seem like a lot of money to rent a game for one night when you can buy many second hand DMD games for under two grand, but don’t forget that each rental involves a lot of work: there’s usually one or two hours driving, lugging a machine around, building it up, providing instructions and driving home, and then the same thing all over again the following day. When you put it like that 130 Euros starts to look pretty inexpensive. Van de Sanden now has Monster Bash, Cactus Canyon, Scared Stiff and Circus Voltaire in his rental collection, but he is not sure how popular they will prove to be. “If I make the price of Cactus Canyon or Monster Bash twice the price of Fish Tales then maybe people will realise that they are something special,” he says. His Matrix machine also gets an outing once a year or so, and occasionally he makes a custom game for corporate customers by creating side decals and a backglass and putting them on an existing game. Otherwise his corporate customers (which account for about half of the business) tend to choose themes closely related to their industry. So it’s no surprise to learn that when a building company wanted a pinball machine to attract visitors to its booth at a week-long construction tools show recently, it chose Pat Lawlor’s Roadshow. December is the busiest month for corporate rentals, with van de Sanden closing down his painting business to cope with the huge demand for pinball machines at company Christmas parties all over the country.